Up to 37,000 pregnant women are among those with no access to safe drinking water, food and medical care in Hait. With hospitals and medical centres destroyed women are giving birth in the street a representative from CARE has said. 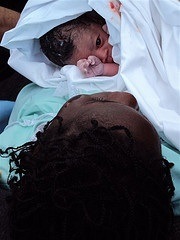 Haiti already has the highest rates maternal mortality in the Western hemisphere, according to UNICEF. Lucinda Marshall writes about the need for specific aid for women and Amie Newman highlights the need for action to make sure women’s health needs do not “fall through the cracks”. In the press, one US aid effort to help pregnant women and newborn women is reported on here.